Colored videos and black and white photos flash on the projector screen behind the live performance of the duo No No Boy. The images reveal the faces of Vietnamese refugees and Japanese survivors of World War II internment camps. 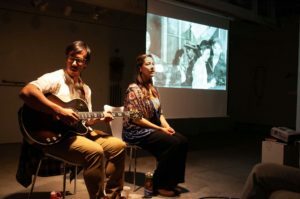 Guitarist Julian Saporiti and vocalist Erin Aoyama sparked conversations regarding Japanese internment, war and displacement. No No Boy performed on Oct. 28 at the Radius Gallery and at UC Santa Cruz on Oct. 29 as part of their “1942” album tour. The duo, comprised of Brown University graduate students Saporiti and Aoyama, reinterprets the history of Japanese, Chinese and Vietnamese experiences in the U.S. through song. The combination of photos and videos of past refugees makes for a humble and moving experience. Aoyama’s soulful voice works well with Saporiti’s acoustic guitar to produce an entertaining performance of untold stories. No No Boy discusses the meaning of each song, allowing the audience to fully understand the song’s history. Saporiti began his research by traveling to Heart Mountain, an internment camp which held over 10,000 civilians of Japanese descent from 1942-45. He interviewed survivors and researched the songs sung in the camp. On the mountain, Saporiti began to connect his mother’s displacement during the Vietnam War to the displacement of the Japanese. This reflection motivated Saporiti to start writing songs and to form No No Boy. No No Boy’s original “Instructions To All Persons” originates from interviews with two Japanese survivors. Aoyama and Saporiti drew on their research to describe how it felt to be rounded up and trapped in camp. They sing of hope, followed by the realization of being imprisoned. UCSC graduate student Jane Komori helped arrange No No Boy’s performances on and off campus. She was excited to bring them to Santa Cruz to let others experience a new type of learning, through music and conversation. Opening for No No Boy were UCSC students Angie Sijun Lou, Mikayla Ann Aruta Konefał and Santiago Alvarez performing their own short stories, poetry and spoken word. Komori believes it is important to get students involved in events like No No Boy, in order for an expression and conversation of history. Saporiti and Aoyama allow others to understand how their past can clear up their present and future. Komori hopes to bring more projects like No No Boy to UCSC to educate students in alternative ways about the Asian American community, folks of color and indigenous communities.